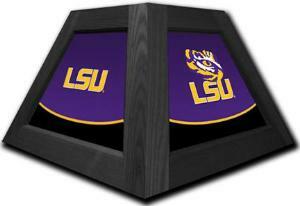 Show your school spirit and define the atmosphere of your game room with a 42" Billiard Table Lamp! The traditional look of the hardwood frame will complement your billiard table and provides up to 400 watts of illumination. The NCAA Team Logo 17" Pendant Lamp is perfect to accompany one of our 42" Billiard Table Lamps, or great as a stand-alone light over a cafe' table, poker table or favorite sitting chair. A great way to show your school spirit!